Jennifer Lin Russell is an assistant professor of Learning Sciences and Policy in the School of Education and a research scientist at the Learning Research and Development Center (LRDC) at the University of Pittsburgh. 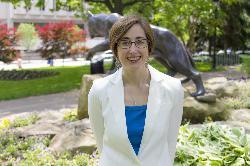 Her research examines policy and other educational improvement initiatives through an organizational perspective. Her recent work examines two primary issues: (1) how schools create social and organizational structures that support reform; and (2) how inter-organizational collaborations can be structured for educational improvement. In the first strand she has examined how teachers’ social networks influence their implementation of reform mathematics practice in two urban districts (Coburn & Russell, 2008; Coburn, Russell, Kaufman & Stein, 2012; Russell, Coburn & Kaufman, in preparation). The second strand of research examines how organizations can productively collaborate to pursue educational improvement. In a recent publication she explored how informal education organizations, such as museums and community centers, collaborate with schools and districts to expand regional educational opportunities for children and youth (e.g. Russell, Knutson & Crowley, in press). And in a new study funded by the William T. Grant Foundation she is collaborating with colleagues at the Carnegie Foundation for the Advancement of Teaching to identify essential capacities and design consideration for the formation of networks aimed at improving persistent problems of education practice. Her research has also been funded by the Spencer Foundation and the Institute for Education Sciences. Recent publications include: “From child’s garden to academic press: The role of shifting institutional logics in redefining kindergarten education” (2011, American Educational Research Journal); “Collaborations bridging the formal-informal divide in an urban educational ecology” (in press, Journal of Educational Change) with K. Knutson and K. Crowley. Co-Investigator (with Mary Kay Stein (PI), Chris Schunn, Lindsay Clare Matsumura, Richard Correnti, Victoria Bill & Dena Zook-Howell). James S. McDonnell Foundation. Teacher Learning to Enact Productive Discussions in Mathematics and Literacy , (5/1/18-4/30/23), $2,499,651. Principal Investigator. Gates Foundation, subcontract from the Tennessee Department of Education (SCORE). Tracking the emergence and development of the Tennessee Early Learning Network (TELN) , (1/1/16-7/31/18), $229,776. Principal Investigator (with Jennifer Sherer and Jennifer Iriti). Nellie Mae Foundation. Developmental Evaluation of the Better Math Teaching Network & Formative Assessment Network, (9/1/16-8/31/18), $625,000 (+ $450,000 pending for 2018-19). Principal Investigator. Spencer Foundation. Designing Organizational Routines to Support the Inclusion of Special Education Students in Secondary Schools. (7/1/14-6/30/17), $296,704. Russell, J. L., Bryk, A. S., Dolle, J., Gomez, L. M., LeMahieu, P. & Grunow, A. (2017). A framework for initiation of Networked Improvement Communities . Teachers College Record. Russell, J. L., Meredith, J. *, Childs, J. *, Stein, M. K., & Prine, D. W. (in press). Designing inter-organizational networks to implement education reform: An analysis of state Race to the Top applications . Educational Evaluation and Policy Analysis. Peurach, D. J., Penuel, W. R., and Russell, J. L. (In press). Beyond ritualized rationality: Organizational dynamics of instructionally-focused continuous improvement. M. Connolly, D. E. Spicer, C. James, & S. D. Kruse (Eds. ), International handbook on schools as organizations. Thousand Oaks, CA: Sage. Resnick, L. B., Russell, J. L. & Schantz, F. (In Press). Expertise for the future: A new challenge for education . In P. Ward, J. M. Schraagen, J. Gore & E. Roth (Eds. ), The Oxford Handbook of Expertise. Oxford: Oxford University Press. Briggs, J., Russell, J. L., & Wanless, S.B. (2018). Kindergarten teacher buy-in for standards-based reforms: A dynamic interplay between professional identity and perceptions of control. Early Education and Development, 29(1), 125-142.